Lucknow, Sep 26 (IANS) Union Home Minister Rajnath Singh on Saturday claimed that the country was safe under the Narendra Modi government, adding there was a significant drop in infiltration attempts across the Indo-Pakistan border in the past one year. Speaking at a conclave here in the state capital, the former BJP president dished out statistics to suggest that in the past 14 months, since the BJP-led NDA government took over, the incidents of infiltration had come down and the number of terrorists killed had gone up. "In 2013, the number of terrorists killed was 67, while in 2014 the number was 110 and this year the number has already touched 130," he said, adding that the "state of preparedness of the security forces has been enhanced under the present government". He pointed out that in 2012 the number of infiltration attempts on the Indo-Pak border were 264, they went up to 277 in 2013, dropped drastically to 52 in 2014 and this year the count dried up to a mere 15. "The union government is clear – there would be no compromise on the safety and security of the country, whatever it takes to do that we will do", he said. 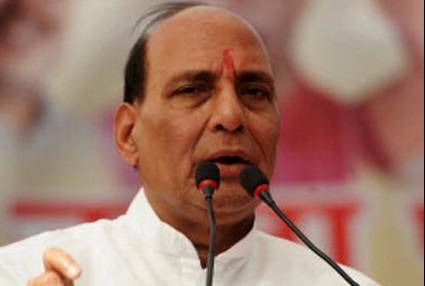 Rajnath recalled his recent stay at a border outpost where he listened to the issues concerning the security personnel. He also informed that the need of infrastructure on the Sino-Indian border would be taken care of very soon. Referring to the 15,106-km-long border India shares with its neighbouring countries and the 7,515 km coastline, he said that the Indo-Nepal and Bhutan borders were peaceful while the Myanmar and Bangladesh ones were "active". The Indo-China and Indo-Pak borders, on the other hand, were "sensitive". "China says there is no clarity on the border… we are trying to tackle the issue at the highest level," the minister said. "We want friendly relations with our neighbours and the invite to SAARC nation heads on the prime minister’s swearing in was a sincere effort in that direction," Rajnath said. He also said that the country would not compromise on national security. Referring to "Left-wing extremism", the minister said that in all 125 districts in the country were affected by Naxalism of which 34 were majorly-affected but the incidents of violence had come down by 35 percent in the last one year. The minister said that he was also trying to improve infrastructure and telecom in these areas.